Sanded the rudders smooth and installed them! Yikers. Where to start? A new week has begun and we were at full throttle, which we imagine will be the case from here on until we splash. Get used to it! But the day started with a bit of a downer. Baw arrived all pepped up to spray the white linear polyurethane (Interthane 990) on the boom. He, Pla and Heru spent an hour preparing the surface. But when he asked Sue for the keys to the compressor (to move it into position for spraying) she had to nix it for the time being. Why? Dark clouds to the south, and humidity over 83%. Poor Baw was anxious to spray while it was relatively cool (82°F/28°C) and all we could figure was that he was so used to high humidity that he didn't feel it. Our skin was damp. He argued that it was very difficult for him to spray in the tent when it was hot. We empathized but had to stand firm. NO spraying with humidity over 70%. We just couldn't risk messing up this coat, as we'd have to take the whole thing off, all the way to back to the aluminum if this top coat failed. Finally Baw came around, spending some time grinding on the anchor support, which needs to be painted soon, too. He and Pla also put more yellow filler on the boom, let it cure, then sanded it smooth. Sort of make‑work but better than un‑doing the whole boom! There was a big storm system south of us, moving southwest(!) and we had to let it play out. We actually got a few dribbles of rain during lunch, which helped us feel justified in putting the delay on the boom spray. Sue brought the last spreaders and spreader poles from the store room back to the boat. Some had been wrapped in cling wrap too soon after getting their Nyalic coating, and they had interesting zebra‑like markings on them. Xylene, applied with a brush, then wiped off with fresh rags, soon had the spreaders looking like nice bare aluminum again. So now we have the anchor support, the prod, the mast base and the spreaders all ready for polishing before they get primed and painted. Akoosh, Chambron, Ben and Yando were the louver guys. They began the day marking the smooth gelcoat with pencils, then wet sanding with 1500 grit. 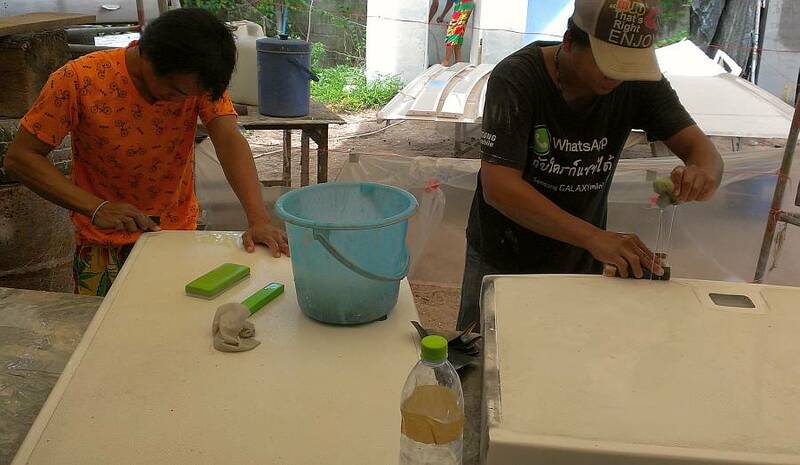 Here in Thailand, Swallow and 3M are the longest lasting wet/dry sandpapers, TOA is not as good, and other brands just fall apart. Once the 1500 was done, they moved on to the finest grit, 2000, which they finished after lunch. YAY! Louvers all ready for polishing! Lek made great strides in the salon with TOA paint remover and a scraper. He got the old varnish off the remaining 4 stationary teak panels on the peninsula. After the removal he carefully sanded the panels to smooth the veneer. Baw checked up on things to be sure Lek wasn't sanding too long or too deep or going through the veneer. Once lunchtime was over, the humidity dropped and the sky cleared. By 2pm it was down to 67% but Baw was complaining about the heat. So we bought him (and everyone else) some refreshing sodas and he was ready to go! With Heru mixing paint and Pla holding the hose away from the boom, Baw got a nice coat of "Ocelot White" Interthane on the boom in just 20 minutes. They had extra paint mixed and it has a pot life of only 1 hour but we didn't have anything to put it on. So Heru offered to paint the toilets, yet again. The concrete exterior wall is now polyurethane Ocelot White. Once the Louver Guys had finished, Chambron and Akoosh teamed up with the polisher and the polishing compound to give the bimini a glorious shine. We'd had an awkward morning about the polisher. It had disappeared into the yard, and when Sue followed up to see why it wasn't near Ocelot, she found not only the polishing machine and our expensive pad, but also our vat of Solar polishing compound and our (very expensive) bottle of 3M polishing compound. She asked for Baw's help to get the stuff back, all the while being pretty adamant that we were not in the yard to provide other boat owners with tools and polishing compound. Jon is still a bit off his feed, and not very productive. 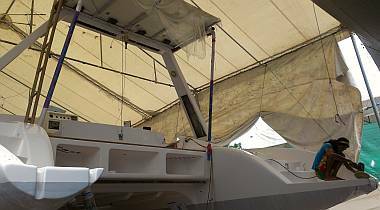 He lashed a bamboo ladder from the aft deck to the solar panels (right by the targa bar) in preparation for mounting the bimini. 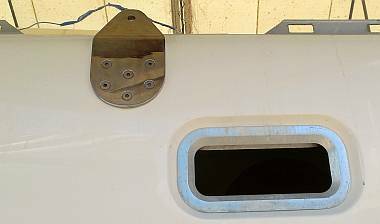 He'll be needing to go up there quite a bit to secure the bimini to the targa‑bar, as the bolt holes haven't been drilled yet. Jon also checked the rudders periodically throughout the day. He'd put them in the sun on Saturday, in hopes of the heat baking the Interseal primer harder (we suspect that too much thinners interfered with the curing of the epoxy paint). While he was waiting he dug out the 2 holes where they have to go so we can pull them into Ocelot. Sue commented that he was digging another wrist‑breaking hole... By afternoon the paint was noticeably harder so he and Sue moved them back to Jon's work area and he sanded the paint nice and smooth. We hope to mount them tomorrow! Houa stripped the broken veneer from the curved seats in the salon, but when it was time to cut new strips, he realized he only had short pieces of the narrow veneer. So he needed to take the new strips from the big veneer pieces that will re‑make the rounded door that got over‑zealously sanded last month. He was supposed to be working on re‑making this for us on his own time, but he hasn't gotten very far with it. But today it made sense for him to use the day to cut the veneer and get it glued onto the curved frame, so he'd know how much we had left. Houa used Hartford Epoxy this time instead of the fast drying wood glue. He and Baw had lots of time to smooth it down, pressing out any air bubbles long before it set. 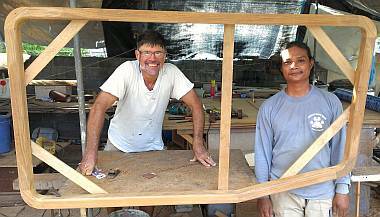 Houa and Jon discussed the "eyebrows" over the galley and companionway, how they are to be positioned and finished. Houa also prepared to removed the aluminum sliding door tomorrow. It needs to be permanently mounted and sealed before he can install the teak door‑frame. We spent much of yesterday (Sunday) getting a long list ready for Baw of all the jobs we still need to do on Ocelot. The yard manager, Cris, will translate it in the next few days. In the meantime we had a long discussion with Baw about "What next?" So many things going on. 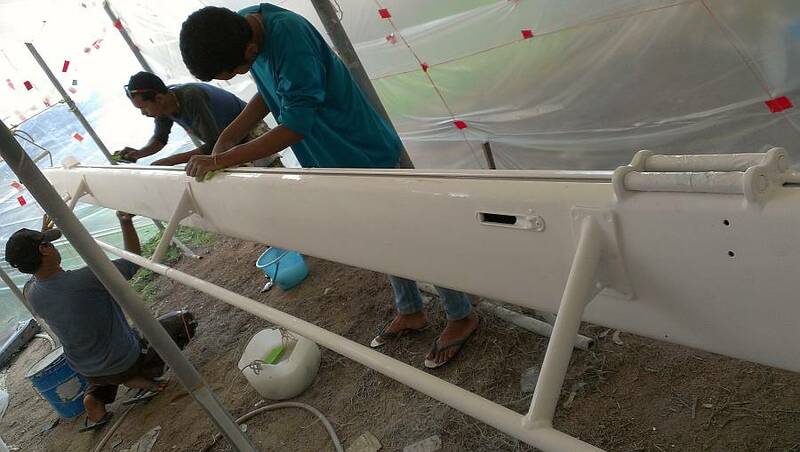 Baw wants to spray a second coat on the boom while it's still in the tent (and maybe another coat on the forebeam as well). 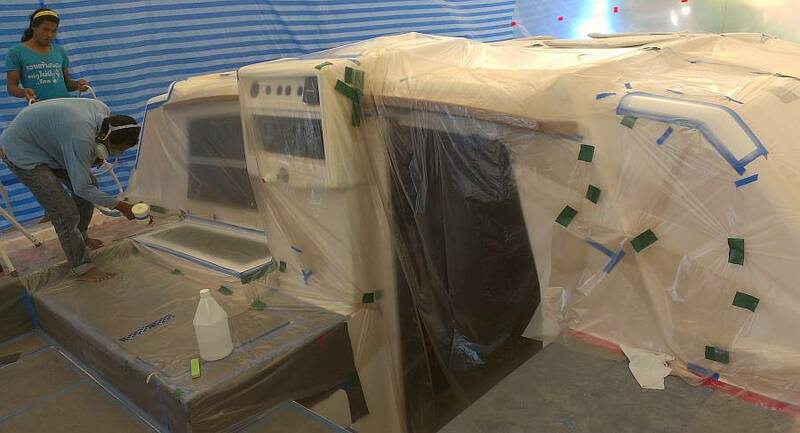 With the bimini polished, he wanted to move it up on deck, but we want the dozen or so gelcoat repairs sprayed first, so we don't have to mask the bimini. We're hoping to do the final gelcoat spray later this week. Then we can mount the bimini, start sanding and varnishing the floorboards, start sanding and painting the mast, and finish the salon varnish. Stay tuned. 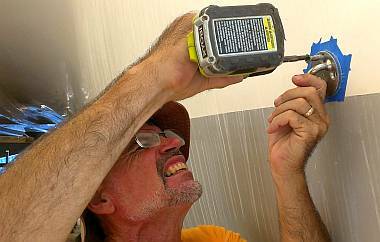 Hot, hot, hot, but at least the humidity was down, so we got some good work done. We had 2 big goals for the day: to spray a second top coat on the boom and to get ready for the final gelcoat spray tomorrow. It was a half‑day for Baw again, so things got pretty concentrated into the morning. Sue scootered out at 8:30 to buy more Interthane 990 (our polyurethane top coat for the spars), then she and Baw set off for the TOA paint store to get it tinted to match our Ocelot White gelcoat. 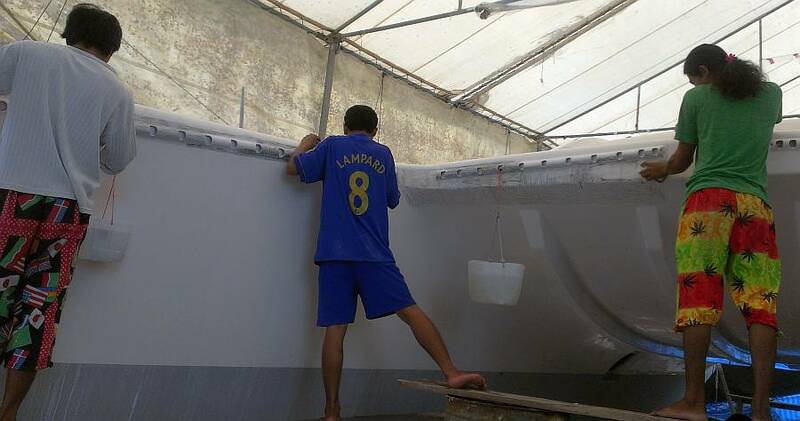 Meanwhile, Chambron and Heru set up a full protective plastic drape over Ocelot's port side. We had noticed yesterday that there was a fine patina of paint speckles on the new deck gelcoat, which did come off easily with an acetone‑wipe. But still, not what we want. We're now fully protected from our enthusiastic paint sprayers! Baw, Pla and Ben spent an hour lightly sanding the boom, then rinsing it. We didn't see if they air‑dried it, or wiped it dry, but they were spraying on Interthane 990 just before lunch. Once Baw was gone the men split up into several areas of work. Pla and Akoosh set up the fan to point along the port‑side deck (which was extra hot with the additional plastic sheeting) and they got several grades of sanding done along the small curved area at the top of the topsides. This area couldn't easily be sanded from the scaffolding when they did the rest of the topsides. In some places the gelcoat was too thin, and it will need a touch‑up spray. This is exactly the sort of thing we're looking out for, so that when we do the final spray of gelcoat, we hit all these little places that need repair. 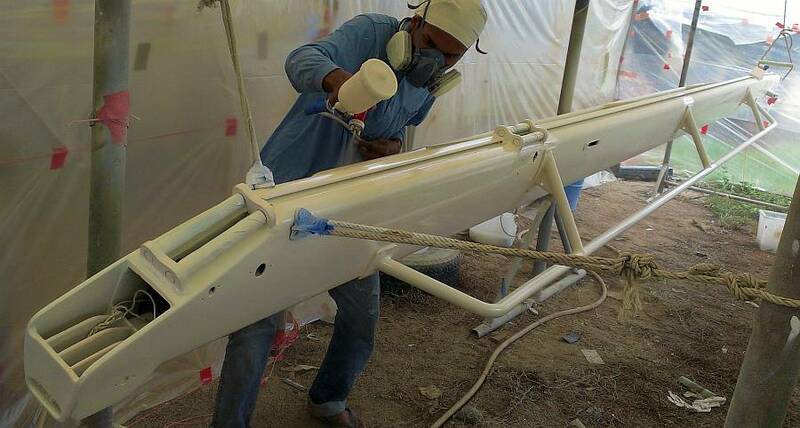 Heru sat in the shade of Ocelot and got the anchor support aluminum almost completely sanded in anticipation of getting painted. Next to him Ben worked alone on the helm seat. We had thought the helm seat was fully sprayed and polished months ago, but apparently Baw is not satisfied with the spray. So Ben was sanding it to 400 grit (again) to see if it needs any dit‑dot repairs or sprays over thin areas. The irony here is that if you sand something often enough to see if it has problems, you'll create problems. Hmm... We just hope we have enough gelcoat to do a good final spray of the seat as it's big and gets lots of wear and tear. Chambron worked independently all day with the polisher and polishing compound. He got the louvers all shiny in the morning. Then he moved to the port sugar‑scoop in the afternoon. This is possibly all part of Baw's plan to get ready for a final gelcoat spray, as he likes to polish things up so that he can see where the gelcoat is thin. 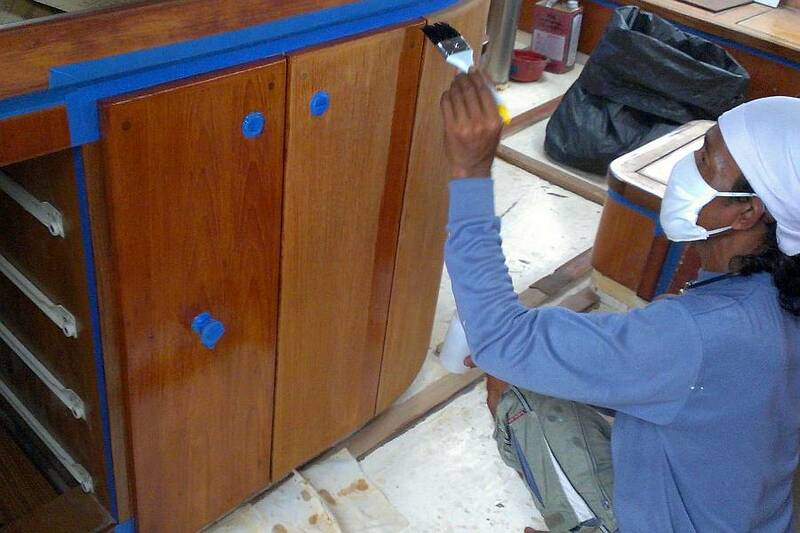 Lek finished sanding the teak panels on the salon/galley peninsula. Sue was worried he might sand too far, but Baw seems to trust him to know what he's doing. In the late afternoon he finished applying the first of 3 coats of thinned West epoxy resin to the bare wood. It was really nice to see the rich lustrous color of these old panels, now renovated with sanding and epoxy. Their color will closely match the one galley panel that Jon added in 2002, and should exactly match the 2 newly‑veneered rounded locker doors. 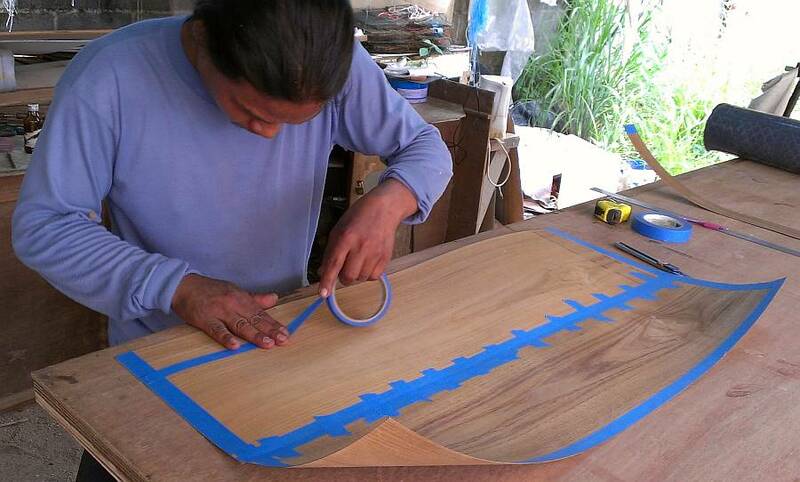 Houa cut out and fitted narrow strips of teak veneer to the top edge of the rounded salon seat backs. By day's end their epoxy glue was cured, and he removed the protective blue tape and cut away the excess glue. Now Lek can sand them and coat with epoxy before they get varnished. Houa also fitted and trimmed the ends of the galley‑side eyebrow (rain catch). 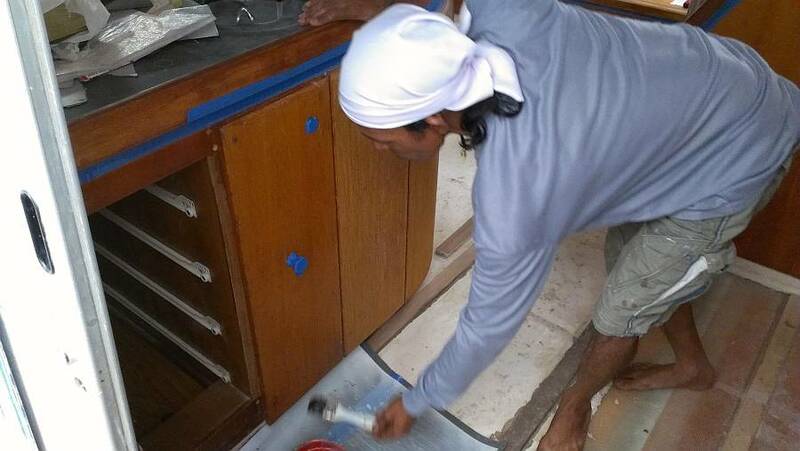 He sanded down the gelcoat, primed the area and teak, the used Sika 298 (the brown stuff that holds the teak cockpit floor in place) to secure the eyebrow in place, along with 4 long screws from the galley bulkhead. Hmmm... That didn't happen when we mounted the rudder bearings, so maybe the rudders are side specific. So we lowered them both, swapped them over, and Voila! Both rose into place easily, and both have an adequate gap between themselves and the hull. The gap on starboard is a bit bigger than we need but both will work. We're looking more and more like a boat! But the work wasn't done. Jon then spent another couple hours in the engine rooms getting all the steering gear reattached. Interestingly, Jon found that we've got variable rate steering, in that the inner rudder turns more than the outer rudder, which is more sophisticated than most steering systems we've seen. Ocelot's got rudders again! WOOT! Sue ran so many errands she ran out of baht, so a bank run was in order. She organized things below Ocelot so that we can move smoothly into the next phase of under‑boat‑work: varnishing the floorboards. The targa‑bar access covers can't be put in place until the bimini is up and they've been laying about getting dusty and possibly scratched so she got them wrapped up and stored on deck. She also cleaned up the salon window that Baw polished. Then she cleaned out some of the engine room junk buckets, cleaning, scraping, de‑rusting, and sorting stuff before it's returned to the clean (and some‑day‑painted) engine rooms. Bo worked again cleaning bilges in the cabins and passageways. Today was starboard's turn and unfortunately it meant having to stack stuff back on the aft bunk with Jon's tools, so it's all a bit cluttered again. 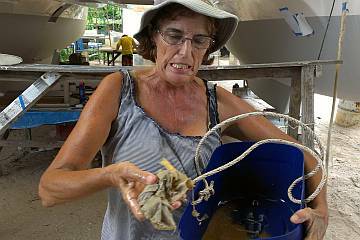 Sue dove into the aft‑most bilge to find the screw‑in plug that holds back the engine room leakage. Grunginess! With the hole scraped out, the plug cleaned up, and re‑installed (by Jon), and the excess oozing oil mopped up it was time for Bo to get the detergent in there and really clean it out. We never had a chance to follow‑up and see how she did. Another hot sunny day, and half way through the week. Not as far as we thought we'd be, but the progress is still forward, which is good. The biggest disappointment of the day was that Baw and Ben were both gone all morning. No warning and no phone call. Just not there. You'd think we'd be used to it by now. Anyway, without Baw's good delegating and management skills we sort of had to let the men do whatever they were doing. Which we assumed was per Baw's direction yesterday morning (since he was gone in the yesterday afternoon). We had hoped to have the main thrust be getting everything ready for a big last gelcoat spray and repair, have it all planned out, so that tomorrow we could arrive and DO it. Heru and Pla created a scaffold around the inside of the bows, so they could clean, sand and prepare the trampoline‑holder area for its last gelcoat. Under Ocelot Yando and Heru sanded the rims of the engine hatches. One of these had received a gelcoat spray after the nonskid was mounted, but one hadn't. It somehow had fallen through the cracks. Akoosh continued with the sanding of the gelcoat on port topsides, right by the toe rail. There are a few places there that the gelcoat was thin (i.e. we see sort of blue/gray color under it) so it will need some re‑spray. The problem is that each spray involves a certain amount of unavoidable waste, mainly because pots can't be emptied completely. We explained that we didn't want a 1kg spray, because we only had 5kg left, and couldn't afford to spray several times, losing precious gelcoat each time to the mixing pots, the gun pot and the gun. But he didn't seem to understand, or he didn't want to. He really wanted to start the series of gelcoat repairs with this one area, and then do all the little "easy" ones later. We asked to talk about it with him, but he obviously had his mind set to do this one shoot. We told him we couldn't get more gelcoat (we can only buy 20kg drums and they cost $350) so we couldn't afford to run short. 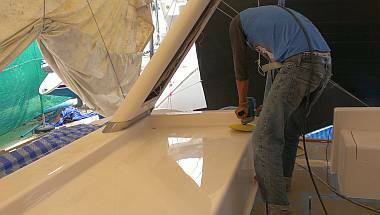 He disappeared to the foredeck to work on small areas that will need gelcoat touch‑ups. We hope to get a bit more back in synch tomorrow and plan this whole thing out. One problem is that we aren't sure which areas he plans to spray repair and which ones he might just touch‑up without spraying. Chambron polished the whole of the starboard sugar‑scoops which felt like an extraneous job given all the "raw" gelcoat that still needs attention. But at least the steps and scoops are shiny and we can see the areas that will need touching up. Ben worked on the helm seat, and did some gelcoat dit‑dot repairs, so we may not have to spray much of it, which would help. Sue marked out places on the deck and sugar‑scoops that are either thin, or the gelcoat is irregularly sloped up to the nonskid, so it doesn't look good. Baw says he can fix these places. Jon had fun installing the pad‑eyes for the bobstays that keep the prod down. These go just above the waterline, as far forward as possible. 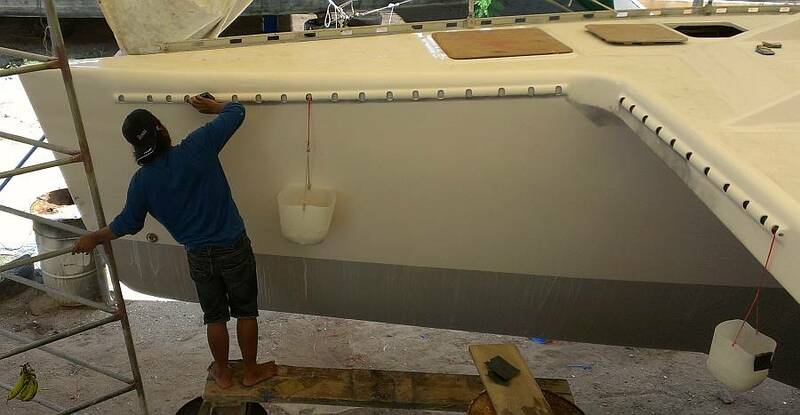 Months ago we de‑cored the hulls, filled them with fiberglass, mounted a huge stainless steel backing plate, and then drilled and tapped the holes for the pad‑eyes, but we couldn't install them until the gelcoat work was finished. Now Jon cleaned out the bolt holes, sanded the area lightly, and bolted the pad‑eyes into the hulls, sealing everything with silicone. He used his impact screwdriver to make sure they were as tight as possible, then went up into the fo'c's'les and put lock‑nuts on all of the bolts. It took longer than we thought it should, but hopefully it will get faster as more bits go back on. 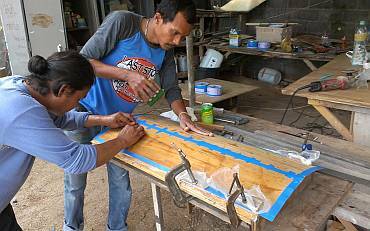 Lek got more layers of epoxy resin on the galley peninsula panels, so that area is moving along nicely. He also epoxied the new teak veneer strips that Houa put in yesterday. 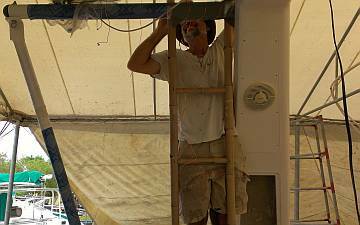 Bo worked down in starboard, cleaning fiberglass dust from inside lockers and up on the cabin ceilings. Sue did check the aft bilge, and was happy to feel no residual oil. It will be interesting to see if the bilges, being gelcoat, will sand down to a brighter color. Houa removed the whole sliding entryway door so he could work on his teak frame for the entryway. It will be exciting when that goes in! The aluminum sliding door and frame were taken under Ocelot where Sue cleaned them up, attacking them with brushes and razor blades to remove splattered gelcoat and lots of silicone which was used to bed it to the boat. As Houa said, "Clean it 100% because not take out again!" Jon and Sue planned and hunted for the next hardware installation projects. That meant time in the store room rummaging through all our gazillions of pieces of boat gear (which is actually all inventoried, but the inventory doesn't always keep up with the moving of items). Installing the 6 waterline "vents" seems like a good project, but the vents need cleaning (they are combined stainless and copper tubing) so we put that aside for the day. Another hot, busy day, with some frustrations and some milestones. Lek was busy inside all day, sanding down his epoxy layers on the salon seat trim and the peninsula panels and the starboard shelf. By mid‑afternoon he had it all prepared and managed to get another coat of epoxy on everything before being kicked out for the gelcoat spray. Sue spent the day scraping and cleaning and digging silicone out of the convoluted aluminum door frame. She managed to only stab herself once with the scraping tool. She also scraped and pulled silicone away from the second salon window on port side. She stopped (happily) when Lek wanted to clean up the salon so he could apply epoxy. 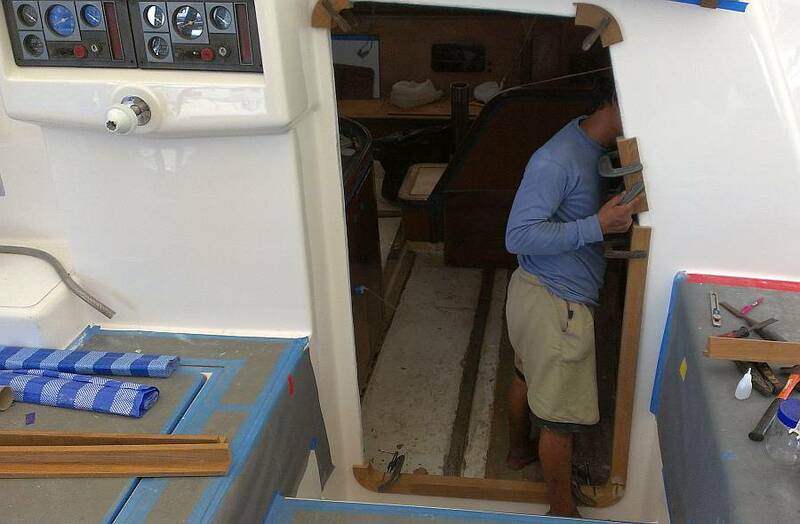 Houa made awesome progress today on the teak frame for the companionway. He used superglue to fit everything together so he could remove the whole frame and take it to the workshop. There he sanded the corners smooth, and used the router to make the edges nice and round. We're calling it the Hobbit Door, as it's surprisingly short. 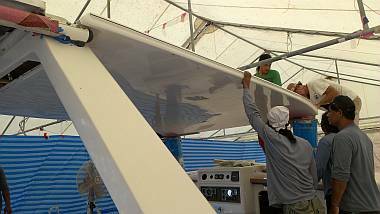 It's actually ½" (13mm) higher than it was, but size is determined by the cut‑out in the boat and the aluminum sliding door frame. Guess we'll have to get used to ducking our heads as we enter once again. Jon began sorting bolts and assembling things to mount the chain‑plates and discovered that we don't have the necessary 12mm drill bit. So he scootered off after lunch, and ended up having to go all the way to Phuket town to Bangkok Hardware (the best place for tools of all sorts). On the way home he grabbed some groceries and put them in the basket of the scooter, only to have the basket fall off about a mile down the road! He finally arrived back at the yard with the basket lashed on with bungee cords and bits of string. Everyone was stuck into their projects today but there was a distressing quiet coming from Baw. Basically, we still hadn't had a chance to talk with him about the gelcoat plans or the spraying. He was cordial, but cool, and carried on his work all day without much interaction. 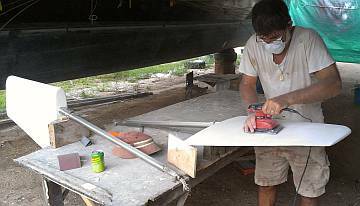 He and Pla worked together to apply gelcoat by paddle to the port sugar‑scoop swim platform where it was a bit thin. They rough‑sanded the "shoulders" of the cabin top, both to port and starboard of the helm where the gelcoat was thin and then masked those areas off. After lunch Baw, Pla, Heru and Chambron did several small gelcoat repairs or preparations on the deck before masking off several areas of the cockpit. Then, at 4pm (while Jon was out running an errand) Baw asked, "Madam, do we spray or not?" Sue looked over the boat and all the masked places, and said, "Sure! What do you spray?" "Two kilos, madam." Then he pointed out the areas he'd prepared: the bow trampoline holders, one engine hatch, the two cockpit shoulders, and the step under the galley window. It didn't meet our original hope of having only 1 last gelcoat spray, but that was a good number of places, and 2kg (of the 5kg we have left) was an OK amount to work with. If there is to be another spray, we'll still have a bit, even with some wastage. So all other work stopped, except for Houa who could stay in his workshop, and Lek, Heru, Baw and Chambron managed the spray. Jon arrived after the first pot and was dismayed to see that Baw had put masking inside the trampoline mounting holes. (Sue had asked about that, and Baw had assured her that Mr. Jon said to do that.) Well, we had closed them off when the poles were still in, but now that we'd taken the fiberglass poles out, we wanted gelcoat inside the holes to protect the fiberglass. No worries, Jon hopped up and used his trusty Swiss Army Knife to pry the masking out. 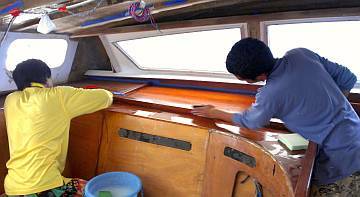 Meanwhile Baw stepped away from the boat to spray the engine hatch which was perched nearby on 2 water jugs. Baw went back to the tramp holders again when Jon finished, then he moved up to the cockpit and sprayed the galley step and the cockpit shoulders. All in all he sprayed for about 30 minutes and used all but 1/4 liter or so. That left‑over does not have catalyst in it yet, so it will keep, and the guys will use it for small repairs and possibly for a future spray. The day ended on a happy note, with everyone pleased with the gelcoat spray, and with plans to sand the newly sprayed areas tomorrow. Also tomorrow they will get the helm seat ready and the swim platforms, which Baw says he wants to spray, because he wasn't happy with his attempt to paddle on the gelcoat. Jon, Sue and Baw were all smiling and laughing which is good, because we had to face the fact that the boom had fallen (due to a rotten rope holding it up!) and had scratched up its new paint somewhat. "No worries. I fix," said Baw. Right. He can do a paint repair when he sprays the mast or the spreaders. But meanwhile we gathered the guys and lowered the boom onto some old water jugs so it's not at risk anymore. A slowly progressive day, but Sue was down with some sort of tummy bug and didn't come to the yard. Houa never showed up (we suspect that he's doing work for a friend) and Bo left after lunch. The day started by ripping off all the plastic masking that was put up for yesterday's spray. It's really too bad that we can't reuse all the plastic sheeting, but gelcoat won't cure if it's too thin (like overspray) and uncured gelcoat is no fun at all. Once the masking was off, the guys got into sanding the gelcoat smooth. They've learned to get to this gelcoat quickly, before it gets rock hard. Yando and Ben spent the day under Ocelot, sanding the helm seat. They got it up to 2000, but couldn't polish it because the power was out all afternoon. Lek spent the day in Ocelot's salon, sanding the epoxy and preparing to brush on more. He should be moving on to varnish (instead of epoxy) pretty soon. 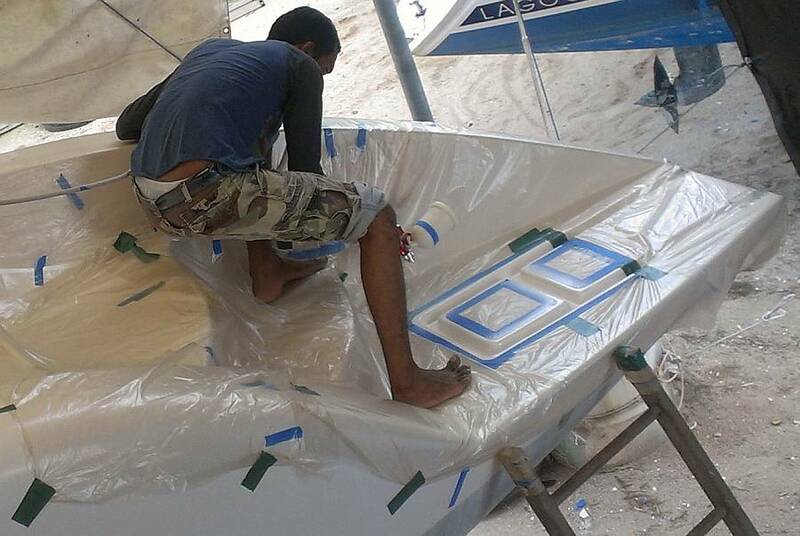 Heru, Chambron, and Akoosh worked on the starboard side trampoline holders, sanding the newly sprayed gelcoat. Jon eventually decided to drill the other holes half way through the hull from the outside, using the chain‑plate itself as the template for where to drill. Then he went inside and did the same thing, using the backing‑plate as the template. When the holes met, the drill self aligned to the new hole, and the ends of the holes (the part that really counts) came out where they're supposed to. Actually mounting the plates took some help from Heru on the outside while Jon fed him bolts gooped in silicone from the inside. The first pass was just to get the bolts in their holes and put their washers and lock‑nuts on. The next pass snugged everything tight, and the third pass tightened all the bolts as tightly as we could. The chain‑plates have behaved themselves for 17 years - hopefully they'll do the same for another 17 years! In the afternoon, Pla, Heru and Baw started masking the ladder grooves in both sugar‑scoops, as the gelcoat is thin in places, as well as a strip along the top of the port topsides. This area is just outside the toe‑rail, and was difficult for Mike to get enough gelcoat onto when he sprayed it many months ago, as it was high up and falling away from him. After Akoosh sanded it the other day, we could tell that the gelcoat was a bit thin and more was needed. These 3 areas aren't very big, so Baw decided to use the left‑over gelcoat from yesterday's spray. Apparently our caution that we're running out of gelcoat is being heeded, which is certainly nice. Baw sprayed each area in turn several times. The ladder grooves are difficult, as it's the vertical walls that are thin, probably because it was sprayed from above. This time Baw had to spray it from the side, which is neither easy or natural. 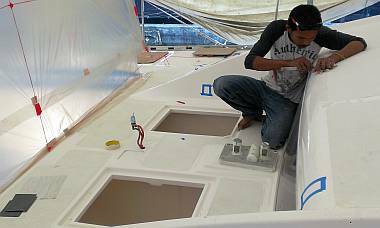 Once the spray was finished, Jon pointed out a tiny thin area on the starboard topsides. Baw said he'd just paddle some gelcoat on there. Okay... But a few minutes later Jon found Baw and Pla masking the area off and Baw gave it a quick spray, which produces a much flatter and smoother finish than paddling does. Saturday, October 26: Bimini Up! Yay, Yay and Hooray! Sue is feeling better, probably because she just HAD to be at the boat for The Great Raising of the Bimini. Yep, raising the bimini was first on Jon's agenda for the day. Baw and the men carried on with the gelcoat sanding and dit‑dot repairing while Jon got everything ready. We already had a handy table placed in front of Ocelot with 2 big drums on top and a board between them, perfect for resting the back of the bimini on as we raised it. 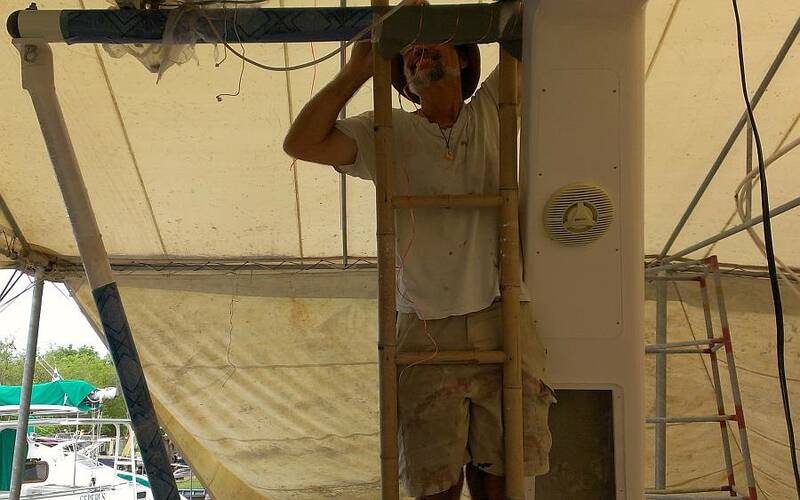 Jon cleared stuff off the bimini, made sure there was enough room between our scaffolding, and tied a 40' (12m) rope to the forward drain hole, with arms out to each side for the men to use to lift the bimini from the deck. Sue cleared off the deck spaces and got ready with the camera. Jon (via translation by Baw) organized the men. 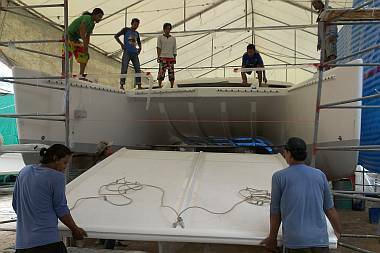 Four below (Houa, Pla, Heru and Jon) to walk the bimini towards Ocelot and rest the back on the wooden scaffolding. The ropes were tossed to Chambron and Lek (the designated "strong men") up on the bows. Then Jon and Heru got on the table and pressed the bimini up to waiting hands while Lek and Chambron lifted by ropes. Stage 1 complete! Then it was a matter of getting all the men up on deck ASAP while the bimini was moved aft. When it got to the cockpit it was again handed off to waiting hands and the back was lifted up to sit on the targa‑bar while Sue organized old gelcoat drums and future‑board for the front to sit on. Jon positioned it (approximately) and the men tied it off, and VOILA! One hard bimini in place! On the gelcoat jobs, Baw sanded and faired the port swim platform repair. Pla worked on the starboard swim‑platform, as well as the port topsides, the curve just below the toe rail that was thin and got sprayed yesterday. The other men all worked on the trampoline holder area up front. 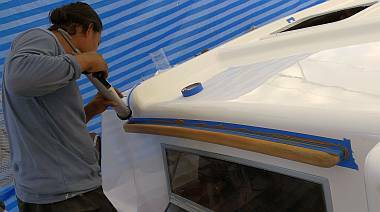 By afternoon we were hearing the whirr of the polisher, and beginning to see lots of shiny gelcoat on the bows. Baw polished the starboard cockpit bench and re‑covered it in new vinyl. 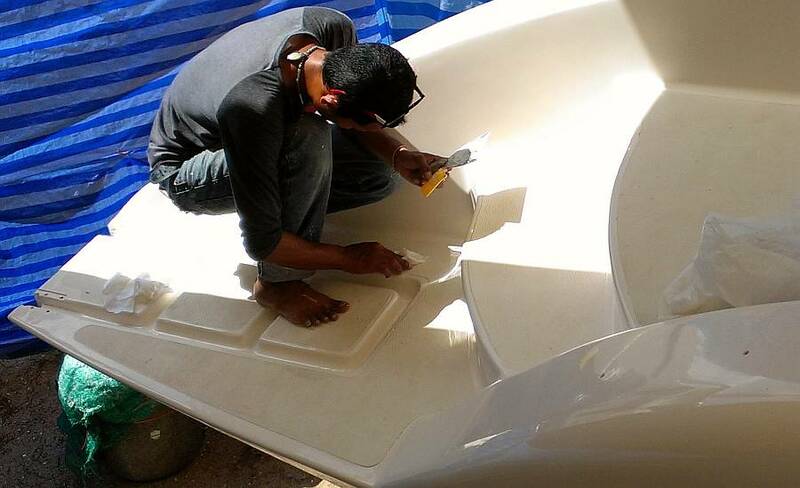 He promises to finish the aft seat as well, on Monday. At end of day Baw pointed out just 3 small gelcoat deficiencies that need repair: 2 on the helm seat (one front, one back) and at the base of the starboard end of the targa bar where 2 different spray times left a color change line which will sort itself out with another small spray. Sue took it easy in the morning by playing photographer and cleaning the edges of the salon window. The second one we took out still had a rim of silicone around it, and getting that off is an easy job but takes lots of calm patience. Perfect for a recovering Madam Sue. After 2 hours she was covered in little bits of black silicone shavings, but had the satisfaction of a window almost 99% clear of the rubbery stuff. Baw offered to take the window home with him to polish it there. We're happy to pay extra time for him to do this. Sue made a bank run for payroll, and picked up some more "Silicone Off" -- a petroleum liquid great for removing masking tape gum as well as softening the last thin layers of silicone. Baw has asked for it because he and Pla were busy cleaning up the insides of the remaining salon windows. And, what a nice surprise, Baw had polished the starboard salon windows, inside and out, so that the louvers can now be replaced! Monday, Monday. Houa pulled apart the starboard hanging closet and all of its rather chintzily made shelves (made in the Galapagos). He'll replace the brackets with heftier teak strips, and put backing strips under the shelves to strengthen them. He also pulled off the hatch frame under the starboard passage floorboard to re‑build the frame with solid wood, instead of ply. The companionway door frame got epoxied together, but then couldn't be moved for the rest of the day, while the epoxy resin soaked into the wood and cured. Houa will mount the sliding entryway door next week, after he and Jon discuss replacing some of the gaskets in the aluminum frame, and what holes to silicone‑close and which to leave open for drainage. Lek and Bo were in the boat most of the day. Lek continued sanding the epoxy on the peninsula panels. We sure hope it's time for polyurethane next week! Bo continued cleaning the cabins, lockers and heads, pretty much under Houa's supervision and by his request. It's Houa who has to work in the interior spaces the most, to do carpentry and eventually to put up the headliners, and he hates fiberglass dust, so he wants it all gone! With the gelcoat on the verge of completion, and the bimini up, we decided to throw a lunch for the workers on Monday. We'll be taking them to By the Grace, our favorite local restaurant, where Angie will cook up awesomely hot, spicy dishes for the workers, and something totally tasty but not hot for Jon and Sue. Catering to the Indonesians, there will be no pork or alcohol. Just as well. We hope to get more work out of everyone after the lunch!